Chapter 6: "The Empty Throne"
Revolution brews in the empire of Minkai as the people take up arms to throw off the yoke of their unnatural oni masters. With the populace rising, the heroes lay siege to the capital of the empire, the ancient city of Kasai. There, they must discover the secrets of emperors past and seek the aid of ageless beings, gathering all the allies they can for a final assault on the bastion of the murderous Jade Regent. Will the heroes and their companions be able to bring an end to the warlord’s tyranny? Or will Minkai remain locked in the grip of true evil? Confront the powers of destiny and shape the fate of a nation in this, the exciting final chapter of the Jade Regent Adventure Path. 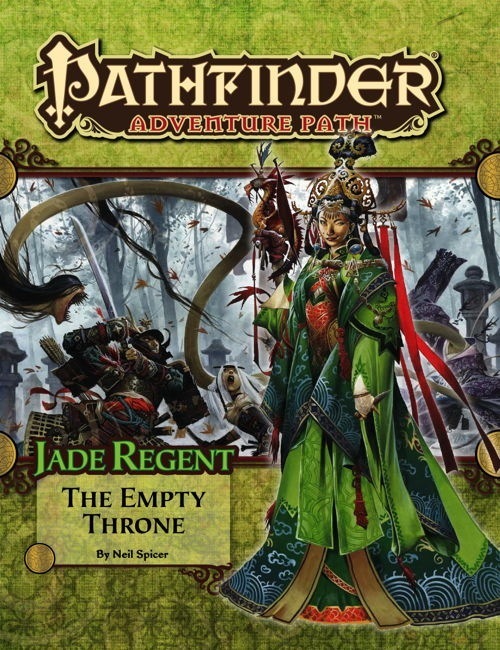 “The Empty Throne,” a Pathfinder RPG adventure for 13th-level characters, by Neil Spicer. Deceit and revelation in the Pathfinder’s Journal, by Dave Gross. Four new monsters, by Jesse Benner, Tork Shaw, and Owen K.C. Stephens. 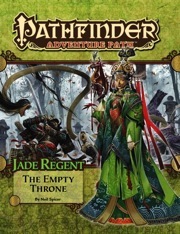 The Empty Throne is sanctioned for use in Pathfinder Society Organized Play. The rules for running this Adventure Path and Chronicle sheet are available as a free download (532 KB zip/PDF). As my group and I begin to enter the final stages of the Jade Regent adventure path, I'm taking a look back at where we have come. Getting into the actual review of this chapter, I found that there is some potential here. I like the premise of part one of this book; building support for Ameiko's claim sounds like something sensible to do. However, I feel that this particular section was rushed, and added in as an afterthought. The second part is where things pick up for the best, in my opinion. No real faults here. The final part is an epic conclusion, but seems to fall flat, though not by much. It seems like a pretty standard confront the final villain. Overall I think it's ok, but I feel like this volume lacks a lot of the eastern theme that makes some of the other volumes memorable. All and all, I find the volume to be good, but lacking something needed. I would do some work yourself before presenting this to a group. overall with the Jade Regent adventure path, I felt that it had potential, but it just missed out on over all. If you plan to run this adventure path, read ahead, and make several changes yourself. Overall for Jade Regent: 3 out of 5 stars, written well, but missing several key points, and being inconsistent between volumes. In Jade Regent, the PCs have set out from their home in Sandpoint, a small town in southern Varisia, trekked north with their caravan to Kalsgard in the Linnorm Kingdoms, then ventured across the frozen Crown of the World to the continent of Tian Xia, crossed through the Forest of Spirits, and arrived in Minkai, the homeland of Ameiko Kaijitsu’s family. Now, having gathered allies, they must set out for the capital city, Kasai, to overthrow the Jade Regent and place Ameiko, the rightful heir, on the throne, in The Empty Throne, the sixth and final instalment of the Jade Regent Adventure Path. Written by Neil Spicer, the adventure has the unenviable task of wrapping up an entire campaign with a suitably epic conclusion, whilst simultaneously allowing for the possibility of more should individual gaming groups wish to continue with their characters. Overall, it manages this pretty well, especially given the difficulties high-level adventures can present to designers. Gaming groups who have played through the entire adventure path will likely find this conclusion exciting, thrilling, and most importantly, satisfying. While the adventure isn’t perfect, few things are, and players aren’t likely to notice its imperfections, especially in the hands of a skilled GM. I've enjoyed the Jade Regent Adventure path so far; it had the right mix of story, combat, roleplay, and new mechanics to keep my players in check. By the time we reached the Empty Throne, the adventure itself facilitated the campaign's close with a sense of urgency and triumph. My favorite part was how the nature of the campaign leads up to not only Ameiko's development, but also the power increase of the PCs. It has been a very long time since an adventure path has done this in such a novel, marked fashion. I highly recommend this adventure and the Jade Regent adventure path as a whole. This review contains spoilers. And it is way too long. I really enjoyed the first 2/3rds of this book, but felt like the last part-- the final showdown and storming the castle-- wasn't even half the quality of the earlier portion. Like all high-level Paizo modules, you get introduced to your bread and butter encounter at the start and then your PCs get to face this encounter six or eight (or even more!) times by the end of the book. Not to say that this book doesn't have some really interesting encounters-- the entirety of the central portion, the Well of Demons and the Imperial Shrine, were exceptional. At the end, however, I couldn't believe that the adventure was ending that soon. It felt like there should have been a second finale, the way the module was headed. The final encounter is really cool, design wise, but story-wise a lot of that encounter comes out of left field, many elements only introduced in this book and not at all mentioned beforehand in the series, some completely untelegraphed except for a name drop. If you've ever had a fear of running several very different high-level NPC spellcasters all in one encounter, well, be afraid of the epic conclusion of The Empty Throne. The revelation that the Jade Regent isn't even the big bad guy-- he's just his grandson-- and the fact that this isn't even a spoiler because the first person you ask about it in Kasai can just plainly tell you this-- was extremely off-putting to me. More so was that I didn't catch onto this hint when I read #4 and #5 again over the weekend, so it really feels like a last-minute retcon. On a quick read of the stats, in book #1's flashback sequence, the Jade Regent becomes extremely large as he cuts down the old emperor-- an ability Anumurumon has, with his change shape ability, but that the Jade Regent does not. So, why the retcon, and what does it gain? The article on Kasai and the continuing the campaign articles had some cool stuff in them, and the bestiary was pretty nice. The art in this book had some of the best and worst-- some of the character portraits look very confused and smudged. The art of the tombstone golem with it's "really evil bad guy glowy eyes" looks very silly. And then some of the half-page pieces are amazing (the opening art of the imperial shrine and a late-book picture of Feiya's fox barking at a dragon come to mind). Jared Blando delivers his very high quality maps again. I noticed Neil Spicer had several moments written into this book where the module advises the DM on what actions Ameiko may take at this point. I felt like this was pretty cool, and wonder if there were others written in but removed during the editing process, as The Empty Throne's adventure runs a few pages long. The final thing to mention about this book is that it was written with the goal of getting to level 16 from 13 in mind-- a goal that makes every single encounter up to 2 CRs higher than suggested for a party of four. My group has an out-- as I began to run the game after playing in it for two modules, I'll just DMPC my old PC in the last stretch-- but many groups, and especially groups where the DM, for lack of a better term, "skims it on the go", expect to see angry posts on the Paizo website ranging from "I'm supposed to make and run a whole high level NPC in this book what is this" to "The paizo writers made this module super powerful and too hard for a party of 2 monks and a sorcerer my DM showed me the book and I hate you neil spicer for TPKing us!" TL;DR: I loved the first 2/3rds, the last 1/3rd is a let down, the support articles are great, the art is pretty good, the maps are clear, encounter design is strong but has weak points and the final encounter is going to be a nightmare to run. 3/5! Announced for January! The product image is a mockup, and will change prior to publication. Hungry "demons" and Ravenous ghost, must be monday! So module starts at 14th level and ends on ... 16th level??? If true.. that's awesome. Now I'm worried how powerful the Five storms and the Jade Regent. We'll see exactly where it starts and ends once we start developing it in a month or two... but yeah. Most of our APs end up capping out around 15th or 16th level. The links to this product from the previous and subsequent issues appear to be broken. We've fixed the previous/next links. Is the level cap for this adventure known yet now that two months have gone by? As I understand it, the manuscript is about halfway through development and Rob's out of the office until Monday. So, I suspect he'll start back on it when he returns. I don't know if he wound up adjusting the level range, but I wrote it for 14th level characters. The PCs should level up about halfway through. And, they get pretty close to 16th by the time they finish. There's actually a pretty good chance the PCs will be a level lower—Tito's adventure ended up being a little short on XP, so it's looking like the top level for Jade Regent is gonna probably be 15th. We'll see where it ends up in a few weeks for sure, though! There you go. Sometimes that becomes necessary. I can only imagine that sewing the adventures together is an interesting (and challenging) process. ... this is very much turning into the adventure where all the NPC friends you've made along the way absolutely CAN accompany you on the adventures. It basically depends on how many NPCs the GM is comfortable running as PC allies... but Ameiko for sure should be along for this final step in the journey. That's actually how I hoped things would come out. I just received word that it is okay for me to mention that I wrote the Kasai article for this. So, I can't wait for this to come out and get feedback from all you guys after you have had a chance to read it. I think folks will really enjoy what I wrote for the city. From what I was told, the Paizo staff that saw what I wrote liked it. Hopefully, everyone else will, too. I look forward to the day when it will finally reach my door. Damn that extra month! With the cover still being a mockup here halfway makes me think it will show up on my doorstep in February with that on the cover. Thanks for the notice... I've updated the product image and description. That creature in the background! Please tell me thats a Rokurokubi! Well...hi there Ameiko...you've...changed a bit recently. Sweet an art and product descrption update. I love that Ameiko still has her trade mark smile. The English in the description is a little weird: "Plots and high-level for GMs eager to continue their Jade Regent campaign"
Love the cover - yay more Feiya too!!! I am loving this cover! The things it implies are very cool. The Inner Sea nobility may have falconry, but clearly the nobility of the Dragon Empires must have Pseudodragonry. I know that I'll catch heck for this, but I cannot stand Reynold's art. Just another ho hum piece. Too stylized for my tastes. I prefer the artist who did the covers on The Serpent's Skull AP. I like the pic of the female pirate captain myself, she looks like Adriana Lima. I like Wayne Renolds art style as well though so I am fine with the cover. A couple more weeks and this one will be mine. Do emails get sent out this regarding the,"its in a week your account will be charged..."? I've updated the product description to match the finished product. Man this looks great. Got the teaser email last night, letting me know I'll be mindlessly refreshing my inbox for the next week or so. I'll be honest, I like the higher level APs more as a general rule, but this one has been immensely enjoyable. I do hope that both the Land of the Linnorm Kings sees a dedicated full AP some time down the road though, and I wouldn't be opposed at all to one that takes place entirely within Tian Xia for all six issues either. Anyway can't wait for this awesome Adventure Path! But fast on to the last adventure! I can't wait for the pirates! My hopes for asian monsters: The 9-tailed golden fox and the goblin/demon cat with two tails are my hopes!! The nogitsune (kitsune oni) from earlier in the AP has nine tails, and if taking kitsune racial feats gives PC kitsune tails (as was stated elsewhere but hasn't actually been mentioned in the two products featuring the PC race), then your own character could eventually get nine tails. Ow now I see! Its the monster named Rokuro-Kubi! I missed the body attached to the long neck, LOL! It looked like a spirit naga from my point of view! Also Dorotabo the undead farmer made from earth and plants, the ghostly grudge/the ring Onryo, the faceless Noppera-Bo and the evil cat Bakeneko should be nice in this last asian bestiary! I am fine with the ninetail fox having shapeshifting powers since that is part of the myths about it. Sincubuc, are those monsters you hope are in this AP or that you some how know are in the book? Well with the Nogitsune being already in the books and also the Kitsune this fox must be a new creature with the appearance of the real myth-kitsune but without its powers. Maybe taking humanoid form, but the picture of the creature must be a fox with 9 tails, not a humanoid something. I don't know if these creatures are in the book, but I hope they are. I also forgot Namazu, but that one is pretty much better off in a pirate Adventure path book, being about water and all. Well you forggot that one of the monsters in the book is suposed to be another type of Oni(Wind Yai?). It would like that version of the ninetail fox be a huge size magical beast(shapechanger). I would like the fox to be medium size, I don't like huge creatures, especially not foxes being huge... I can remember one game/cartoon/story where the nine-tailed fox would have curse-abilities, each of its nine tails holding a different curse in them which are spread by touch, I would like the fox to be like that. And I don't like all elemental-oni so that isn't a wish of mine and so I didn't mentioned them in my wishlist. The Oni is a given, more then likely it will the Wind Yai, but it could be another type. Well I can't wait to get my copy in the mail. More for patting myself on the back more than anything else. Because Frank Carr and I wrote the gazatteer in this volume. (I know the adventure turned out longer than expected and some of the gazatteer was cut to accomodate the longer adventure, and I'm quite curious what made it and what didn't). Also, I designed the map for the City of Kasai. Now Paizo's own cartographer actually created the final map, so as to be consistent with the other maps in the adventure - but city layout, the canals, rivers, bridges, building locations, the various quarters of the city and the emperor's fortress is all my design. I actually placed more than 8500 buildings in this map with the goal of creating a city around 90,000 population, and possibly the largest city in Golarion. Its the largest city map I've ever created and am curious at how closely hewn is the final map, to my original design. I can't help but notice, looking at the poster map, that it says "Map Not to Scale." How do we interpret this? Man I am excited about this one. I really dig that cover image. Largest city as in surface area? Because Absalom is a quarter million people, and i'm sure there's 100k metropoli around the Inner Sea. Well considering I didn't make the final rendition of the map (or what changes if any exist between my map and The Map), and since I don't have this product in my hands to look at it and answer you directly, I really need to wait until I see it. That said, comparing to the map I originally created the smallest buildings in the map are 30' x 30' in size. If you look at the square city section (surrounded by canals) at the center of the map, to the left side (west) of the fortress area (the main part, not the section of samurai town to the south of the fortress complex)is roughly 900' east to west. Add in the width of single canal and you've got 1000'. I didn't label the original map, nor place a scale, as I was asked simply to create the layout of the city.